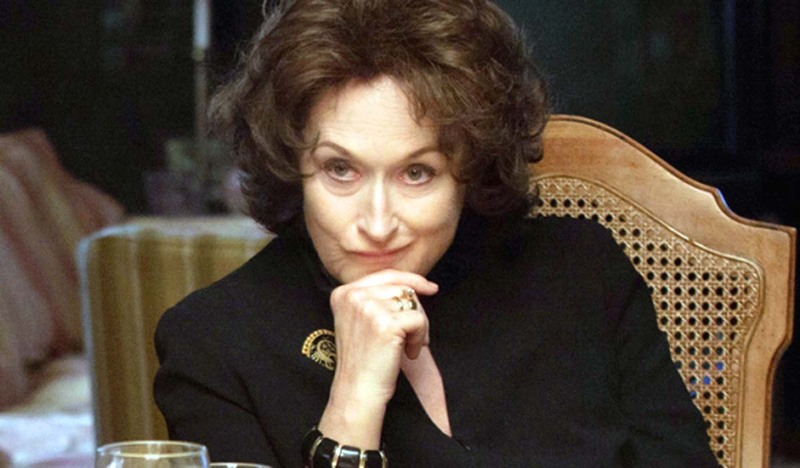 Meryl Streep Oscar nominations record: Smirky mother in August: Osage County. Now, this year marks Meryl Streep's 18th Academy Award nomination – her 15th as Best Actress. And that means Streep has broken the record for Academy Award nominations in the acting categories. The previous record holder was … Meryl Streep, with 17 nods (1978-2011). In fact, in the Academy Awards' acting categories Streep is not only the record-holding nominee, but she's also the record-holding loser – having failed to take home the golden statuette 14 times to date. Meryl Streep's three Oscar wins were as Best Supporting Actress for Kramer vs. Kramer (1979), and as Best Actress for Sophie's Choice (1982) and The Iron Lady (2011). Here are all 18 Meryl Streep Oscar nominations, in chronological order, including directors and co-stars, in addition to Streep's competitors. Note: All nominations are in the Best Actress category, unless otherwise noted. Michael Cimino's The Deer Hunter (1978), with Robert De Niro, John Cazale, and Christopher Walken. Meryl Streep's fellow Best Supporting Actress Oscar nominees: Penelope Milford for Coming Home, Maureen Stapleton for Interiors, Dyan Cannon for Heaven Can Wait, and winner Maggie Smith for California Suite. Robert Benton's Kramer vs. Kramer (1979), with Dustin Hoffman, Jane Alexander, and Justin Henry. Meryl Streep's fellow Best Supporting Actress Oscar nominees: fellow Kramer vs. Kramer player Alexander, Mariel Hemingway for Manhattan, Barbara Barrie for Breaking Away, and Candice Bergen for Starting Over. Karel Reisz's The French Lieutenant's Woman (1981), with Jeremy Irons. Meryl Streep's fellow Oscar nominees: Marsha Mason for Only When I Laugh, Diane Keaton for Reds, Susan Sarandon for Atlantic City, and winner Katharine Hepburn for On Golden Pond. Alan J. Pakula's Sophie's Choice (1982), with Kevin Kline and Peter MacNicol. Meryl Streep's fellow Oscar nominees: Debra Winger for An Officer and a Gentleman, Julie Andrews for Victor Victoria, Jessica Lange for Frances, Sissy Spacek for Missing. Mike Nichols' Silkwood (1983), with Kurt Russell and Cher. Meryl Streep's fellow Oscar nominees: Debra Winger for Terms of Endearment, Julie Walters for Educating Rita, Jane Alexander for Testament, and winner Shirley MacLaine for Terms of Endearment. Sydney Pollack's Out of Africa (1985), with Robert Redford and Klaus Maria Brandauer. Meryl Streep's fellow Oscar nominees: Jessica Lange for Sweet Dreams, Whoopi Goldberg for The Color Purple, Anne Bancroft for Agnes of God, and winner Geraldine Page for The Trip to Bountiful. Hector Babenco's Ironweed (1987), with Jack Nicholson, Carroll Baker, Michael O'Keefe, and Diane Venora. Meryl Streep's fellow Oscar nominees: Sally Kirkland for Anna, Glenn Close for Fatal Attraction, Holly Hunter for Broadcast News, and winner Cher for Moonstruck. Fred Schepisi's A Cry in the Dark (1988), with Sam Neill. Meryl Streep's fellow Oscar nominees: Glenn Close for Dangerous Liaisons, Melanie Griffith for Working Girl, Sigourney Weaver for Gorillas in the Mist, and winner Jodie Foster for The Accused. Mike Nichols' Postcards from the Edge (1990), in which Streep plays a fictionalized version of Star Wars' Carrie Fisher, opposite Shirley MacLaine as a fictionalized version of Singin' in the Rain's Debbie Reynolds, Fisher's real-life mother. Also in the cast: Dennis Quaid, Gene Hackman, and Richard Dreyfuss. Meryl Streep's fellow Oscar nominees: Joanne Woodward for Mr. and Mrs. Bridge, Anjelica Huston for The Grifters, Julia Roberts for Pretty Woman, and winner Kathy Bates for Misery. Clint Eastwood's The Bridges of Madison County (1995), co-starring Eastwood. Meryl Streep's fellow Oscar nominees: Elisabeth Shue for Leaving Las Vegas, Sharon Stone for Casino, Emma Thompson for Sense and Sensibility, and winner Susan Sarandon for Dead Man Walking. Carl Franklin's One True Thing (1998), with Renée Zellweger, William Hurt, and Tom Everett Scott. Meryl Streep's fellow Oscar nominees: Fernanda Montenegro for Central Station, Cate Blanchett for Elizabeth, Emily Watson for Hilary and Jackie, and winner Gwyneth Paltrow for Shakespeare in Love. Wes Craven's Music of the Heart (1999), with Angela Bassett, Aidan Quinn, Gloria Estefan, and Cloris Leachman. Meryl Streep's fellow Oscar nominees: Annette Bening for American Beauty, Julianne Moore for The End of the Affair, Janet McTeer for Tumbleweeds, and winner Hilary Swank for Boys Don't Cry. Spike Jonze's Adaptation (2002), with Nicolas Cage, Chris Cooper, and Tilda Swinton. Meryl Streep's fellow Best Supporting Actress Oscar nominees: Kathy Bates for About Schmidt, Queen Latifah for Chicago, Julianne Moore for The Hours, and winner Catherine Zeta-Jones for Chicago. David Frankel's The Devil Wears Prada (2006), with Anne Hathaway and Stanley Tucci. Meryl Streep's fellow Oscar nominees: Kate Winslet for Little Children, Penélope Cruz for Volver, Judi Dench for Notes on a Scandal, and winner Helen Mirren for The Queen. John Patrick Shanley's Doubt (2008), with Philip Seymour Hoffman, Amy Adams, and Viola Davis. Meryl Streep's fellow Oscar nominees: Anne Hathaway for Rachel Getting Married, Angelina Jolie for Changeling, Melissa Leo for Frozen River, and winner Kate Winslet for The Reader. Nora Ephron's Julie & Julia (2009), with Amy Adams. Meryl Streep's fellow Oscar nominees: Helen Mirren for The Last Station, Carey Mulligan for An Education, Gabourey Sidibe for Precious, and winner Sandra Bullock for The Blind Side. Phyllida Lloyd's The Iron Lady (2011), with Jim Broadbent. Meryl Streep's fellow Oscar nominees: Viola Davis for The Help, Glenn Close for Albert Nobbs, Rooney Mara for The Girl with the Dragon Tattoo, and Michelle Williams for My Week with Marilyn. John Wells' August: Osage County, with Julia Roberts, Margo Martindale, Ewan McGregor, Juliette Lewis, Abigail Breslin, Chris Cooper, Julianne Nicholson, Dermot Mulroney, Sam Shepard, and Benedict Cumberbatch. Meryl Streep's fellow Oscar nominees: Sandra Bullock for Gravity, Judi Dench for Philomena, Amy Adams for American Hustle, and likely winner Cate Blanchett for Blue Jasmine. Meryl Streep August: Osage County photo: The Weinstein Company. 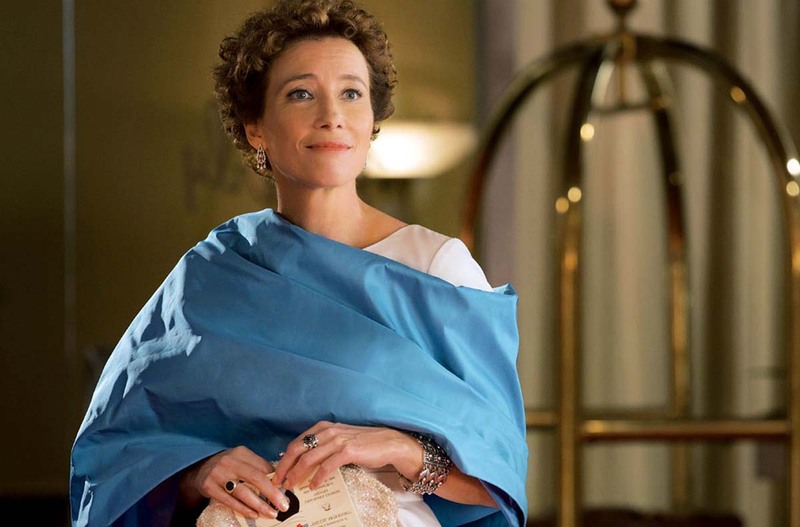 Emma Thompson in Saving Mr. Banks. The Academy of Motion Picture Arts and Sciences uses the preferential voting system to select the nominees in the various Academy Award categories and – pre-1944, post-2009 – the Best Picture Oscar winners. When it comes to the nominations, that means an ardent minority has a good chance of selecting a nominee, whereas a widely popular – but not ardently popular – choice may be left out of the Oscar shortlist. Oscar 2014 non-nominees Tom Hanks and Emma Thompson likely had their names listed on numerous (perhaps even on a wide majority) of ballots; Hanks for Paul Greengrass' Captain Phillips, Thompson for John Lee Hancock's Saving Mr. Banks. But if in most instances they weren't listed at or very near the top, they'd have little chance of earning a nomination, especially if there was an – even if a relatively small – ardent number of voters placing, for instance, SAG Award non-nominee but eventual Best Actress Oscar nominee Amy Adams on the Oscar ballot's no. 1 and no. 2 slots. Not helping Emma Thompson was the fact that, unlike Oscar 2014 Best Picture nominee Captain Phillips, Saving Mr. Banks clearly lacked many ardent fans in the Academy. Touted as a likely Best Picture contender, the “inspirational” drama about how Walt Disney (Tom Hanks) convinced P.L. Travers (Emma Thompson) to sell Disney the rights to Mary Poppins ended up with only one Oscar 2014 nomination: for Thomas Newman's original score. Now, despite rumors to the contrary, Meryl Streep's widely disseminated assertions that Walt Disney was both anti-Jewish and anti-female had negligible – if any – impact on the results. After all, Streep's anti-Disney remarks were voiced while she was presenting the Best Actress Award to Emma Thompson at the National Board of Review Awards ceremony on the evening of January 7, 2014, while the Oscar's voting deadline was at 5 p.m. PT the following day. For the record, the 2014 Oscar nominees for Best Actor are Christian Bale for David O. Russell's American Hustle, Bruce Dern for Alexander Payne's Nebraska, Leonardo DiCaprio for Martin Scorsese's The Wolf of Wall Street, Chiwetel Ejiofor for Steve McQueen's 12 Years a Slave, and Matthew McConaughey for Jean-Marc Vallée's Dallas Buyers Club. The Best Actress nominees are Amy Adams for American Hustle, Cate Blanchett for Woody Allen's Blue Jasmine, Sandra Bullock for Alfonso Cuarón's Gravity, Judi Dench for Stephen Frears' Philomena, and Meryl Streep for John Wells' August: Osage County. Emma Thompson has a total of five Oscar nominations to her credit, including two wins: Best Actress for James Ivory's Howards End (1992), Best Actress for Ivory's The Remains of the Day (1993), Best Supporting Actress for Jim Sheridan's In the Name of the Father (1993), Best Actress and Best Adapted Screenplay for Ang Lee's Sense and Sensibility (1995). Thompson won for both Howards End and for her adaptation of Jane Austen's novel. Emma Thompson will next be seen in Richard Laxton's Effie Gray, featuring Dakota Fanning, Claudia Cardinale, Robbie Coltrane, and Julie Walters. As found on the IMDb, upcoming Emma Thompson movie projects include Jason Reitman's Men, Women & Children, with Jennifer Garner, Adam Sandler, and Judy Greer; Nicholas Racz's The Secret Evidence; the Katy Brand-written Settle Down; James McTeigue's thriller Survivor, with Milla Jovovich, Dylan McDermott, Pierce Brosnan, and Angela Bassett; and a remake of My Fair Lady (George Cukor's Oscar-winning 1964 version starred Rex Harrison and Audrey Hepburn). Emma Thompson Saving Mr. Banks photo: Walt Disney Studios. Best Actress Oscar nominee Amy Adams in American Hustle. The Oscar 2014 nominations were announced early on Thursday morning, Jan. 16, at the Academy of Motion Picture Arts and Sciences' Samuel Goldwyn Theater. Was Amy Adams shortlisted for American Hustle? Did Meryl Streep break another Oscar record? Did Robert Redford nearly break the record for longest gap between nominations in the acting categories? Was Jennifer Lawrence snubbed? Did Scarlett Johansson make Oscar history for her voice performance as Joaquin Phoenix's love interest in Her? Was Peter Jackson-Ian McKellen's The Hobbit: The Desolation of Smaug shortlisted in the technical categories? Well, you'll find the answers to all these questions here (and that includes the list of Oscar 2014 winners). Be prepared: as usual, there were quite a few surprises. In addition to several of those mentioned at the beginning of this article, here are those left out of the 2014 Oscar nominations: Emma Thompson and Tom Hanks (as Walt Disney) for John Lee Hancock's Saving Mr. Banks; Margo Martindale for John Wells' August: Osage County; Will Forte for Nebraska; George Clooney for Gravity; Alex Ebert for J.C. Chandor's All Is Lost; Hans Zimmer for 12 Years a Slave; and Adèle Exarchopoulos and Léa Seydoux for Abdellatif Kechiche's Blue Is the Warmest Color. Also: production designers Alfred Yau and William Chang for Wong Kar-Wai's The Grandmaster; Forest Whitaker and Oprah Winfrey for Lee Daniels' The Butler; Tom Hanks and Paul Greengrass for Captain Phillips; Daniel Brühl, and film editors Daniel P. Hanley and Mike Hill for Ron Howard's Rush; and the sound mixing and editing teams of Shane Black-Robert Downey Jr.'s Iron Man 3, Francis Lawrence's The Hunger Games: Catching Fire and Gore Verbinski-Johnny Depp-Armie Hammer's The Lone Ranger. Last batch: Brian Percival's The Book Thief; Oscar Isaac for the Joel and Ethan Coen's Inside Llewyn Davis; Idris Elba for Justin Chadwick's Mandela: Long Walk to Freedom; and the special effects teams of Marc Forster-Brad Pitt's zombie movie World War Z, Joseph Kosinski-Tom Cruise's Oblivion, Guillermo del Toro-Charlie Hunnam's Pacific Rim. Note: Previously mentioned as an Oscar 2014 possibility, Inside Llewyn Davis' “Please Mr. Kennedy” was ineligible for the Best Original Song Oscar, and thus so were its songwriters: Ed Rush, George Cromarty, T Bone Burnett, Justin Timberlake, Joel Coen, and Ethan Coen. Amy Adams American Hustle photo: Columbia Pictures / Sony Pictures. Golden Globe Awards: Meryl Streep & George Clooney Shoo-Ins + Best Director Angelina Jolie? Performance Capture & the Oscars: Can Actors' Work Be Fairly Assessed? This year, I not see the Oscar: not there is Emma Thompson. I want Emma in nomination. Daniel Bruhl was the most disappointing omission. He was brilliant in Rush. The Sound Mixing and Editing should've definitely been nominated too. Where is Pacific Rim; the movie was worth a nomination in the Best Visual Effects category! Emma Thompson not in nomination: shameful.